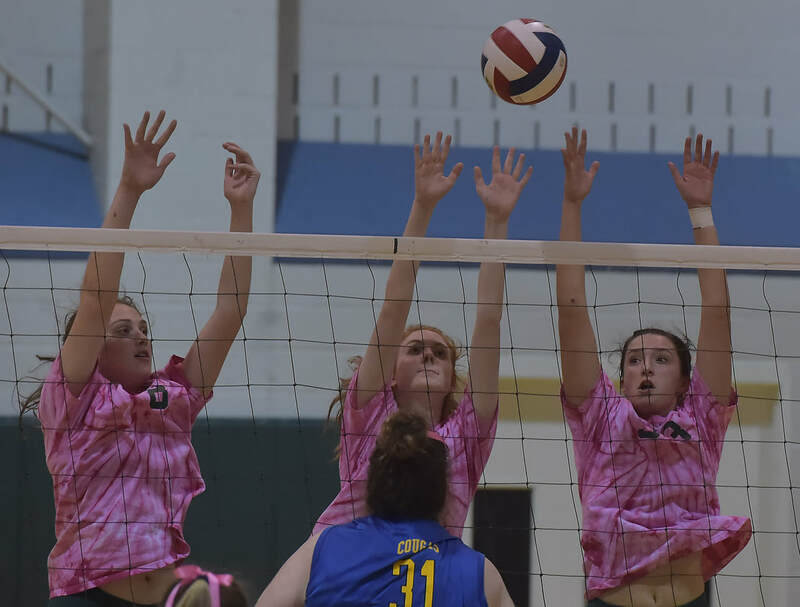 Bishop Shanahan has dominated Ches-Mont volleyball so thoroughly and for so long, somebody in the student section actually brought a broom to Thursday’s league showdown with unbeaten Downingtown East. And it wasn’t to help out the janitorial staff. And the unblemished Eagles went out and somehow exceeded those lofty expectations by sweeping the Cougars 25-20, 25-8, 25-11. It took just over an hour and was the volleyball equivalent of a mercy-rule blowout. “We had a mission. There was a lot on the line,” said Shanahan head coach Greg Ashman. Now 11-0 in the league (14-0 overall), Shanahan clinched the National Division title and are two wins away from closing out another Ches-Mont crown. As a program, the Eagles have not dropped a match to any District 1 opponent in more than three calendar years. A win over the No. 3 team in the district 4A power rankings should solidify the Eagles’ position at the top by percentage points over Upper Merion. And Ashman said, in no uncertain terms, that “we want the top seed.” But the win over East (10-1, 15-1 overall) was also a milestone for Ashman, who is in his 15th season at the helm. Shanahan responded impressively, and did it without the full services of senior all-conference libero Julie Gallagher, who is recovering from a concussion. She played sparingly but Grace Casagrande filled in seamlessly. “We have a rivalry with (Downingtown East), and we wanted to give coach Greg his 300thwin. So there were a lot of things going on,” said senior hitter Michaela Devlin. The Eagles staged great starts in each of the first two sets. It was 9-4 in the first and 8-3 in the second, and Shultz was a force in closing out both. A junior who missed most of last season with an injury, Shultz had two kills and an ace in the later stages of the initial win, and then had two more impactful kills in the second. “Somebody said to me that (Shultz) should be illegal – and I still have another year with her,” Ashman said. “She is a phenomenal player and is a kid that is always trying to get better. I can’t imagine her ceiling if she continues to progress the way she is. The third set was tied six times early, but Gallagher served for four straight points to open a 10-6 lead. Hopton called two timeouts to try to slow down the momentum, but Shultz had three more kills, Bridgette Kelly added two blocks the rest of the way as Shanahan cruised. “I am very disappointed we were unable to give them more of a match,” said Hopton, who used all six of her allotted timeouts on Thursday. Shultz led the way with 12 kills and chipped in with 10 digs, two blocks and three aces. Devlin (seven kills, three blocks) and Julia Thomas (three kills, six blocks) were also highly effective at the net. “I didn’t expect us to beat them in single digits. But it was definitely one of our better performances this season,” Devlin said. Ashman said that it wasn’t the Eagles best outing this season, but it was the best in a couple weeks. He credited his team’s ability to take control in the early going. Victoria Rudolph had four kills for the Cougars and teammate Rachel Wertz led the way with eight digs. “You want your players thinking positively and that the next point is a new game,” Hopton explained.